Originally referred to as the Underground Rail Loop in Melbourne, the City Loop is a largely underground, partly-elevated and partly-surface level Metro as well as railway transport system located around the central commercial district in the city of Melbourne in Australia. While plans for a Metro system in Melbourne date back to the year 1929 when the suburban railway network was electrified, it was only between the years 1981 to 1985 that services on the City Loop route were gradually pressed into operation. In January of 1981, stations at Caulfield, Burnley and Museum were opened while a couple of years later the Parliament station began operations. The months of january and May in 1985 witnessed the respective opening of services from the Flagstaff and Northern Tunnel stations. Tunnels in the City Loop of Melbourne stretch over twelve kilometers featuring both box tunnels as well as circular tunnels. While the estimated cost was pegged at around forty-million pounds in 1965, unchecked inflation resulted in the costs shooting up to over two hundred million pounds. Finally, the project was completed for five hundred million pounds and succeeded in reversing a thirty-year old trend of falling patronage for the suburban railways. 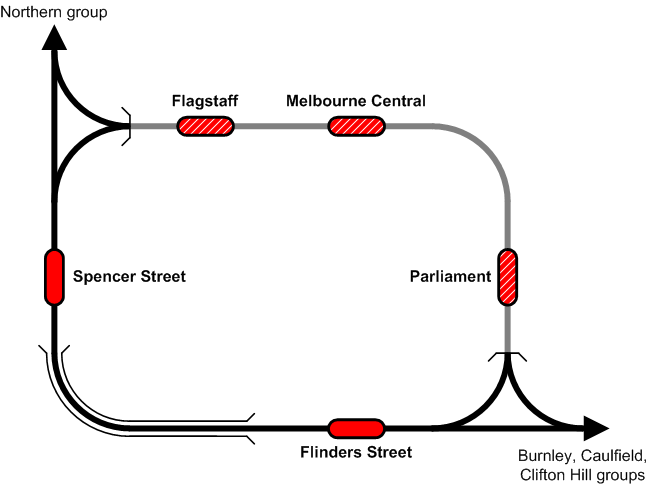 Map of Melbourne City Loop showing its stations. Click on the map to enlarge it or Download City Loop (Melbourne) map in PDF. The loop features two of the largest stations in the city: Southern Cross and Flinders Street, both of them located above ground. The three other stations on the route: Parliament, Melbourne Central and Flagstaff are located at underground levels. The sixteen radial suburban lines that serve Melbourne city feed into the City Loop along the edges at the southeast and northwest of this network.